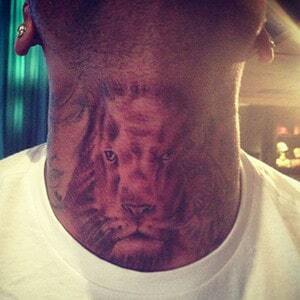 Not long ago, Chris Brown had a very controversial neck tattoo that looks very similar to his ex girl friend Rihanna. It was the talk of the town at that time, because the neck tattoo looks like a beat up woman. But according to his representative, the tattoo isn’t what most people think it is, but actually a sugar skull and a Mac cosmetic design that Chris saw. This week, he posted a couple of photos of his new neck tattoo on twitter to show off to his fans. The new tattoo covers most of the front side of his neck, next to his controversial neck tattoo. The image is a lion’s head which according to him is a “Symbol of Christ and Freedom”. There are no other information on when or where he got the new tattoo but surely these details will later reveal itself in due time.